1997 was not exactly a fun time to be a Weezer fan. The band’s second album was a critical and commercial bomb. Despite the creativity and rock found on Pinkerton, people instead were listening to the Wallflowers and the Verve Pipe. The founding members of the Weezer fan club died in a car accident and the band was taking some time off due to creative tension, with rumors that one member was about to leave for good. But near the end of the year, some rumors started popping up on fan-run news sites. Lead singer Rivers Cuomo, who was in Boston attending Harvard, had formed a side band backed by local musicians and had been playing shows at local venues. The songs played at these shows were both songs never intended for Weezer and possible future Weezer songs. The final one of these shows took place 20 years ago today. Joining Rivers and local musicians was drummer Pat Wilson, out from LA in an effort to find some common ground with Rivers. Bassist Matt Sharp was also supposed to appear, but was not able to make the trip. The eight-song set was a tight show, featuring three new songs (Rosemary, Baby, The Prettiest Girl in the Whole Wide World) and five Weezer entries (Getchoo, No One Else, Say it Ain’t So, Undone and Only in Dreams). Rivers and Pat would find their common ground, and would end up (as Rivers said at the start of the show) going out to LA to make a new record. But a whole set of challenges would meet them when they reached the West Coast, including the loss of Matt, recruiting a new bassist and Rivers being unsatisfied with any creative direction developed despite his prodigious musical output (A few years back, I wrote a rather lengthy article on that, check it out here). By the time Weezer released their third album, it was a new century and the band was going in a totally different direction. As I mentioned earlier, news of this and the previous Boston shows hit Weezer fan sites pretty much right away. Back in January of ’98, I had just started the second semester of my third year of college. I e-mailed one of the attendees, who said he would do a 2-for-1 swap for a recording of the show (in other words, if I sent him two blank tapes, he would send me one tape back with a recording of the show). I sent off the tapes and days later, I received one back. The guy (I don’t remember his name) had written up an essay about the tape- he attended three of Rivers’ shows and recorded all three. The essay was heartfelt about his time as a fan of the band. I listened to the tape and fell in love with the songs- both the ones intended for future Weezer use as well as the “goofball, country” songs Rivers penned. The sound quality was a little rough and in the years since a few of the songs have had official releases (in either full-band or demo form), but two of the more intriguing ones, Baby and Rosemary, only exist in the recording from this show. Still, these songs and this show will hold a special place for me, because in a time when everyone was singing along to Tubthumping or MmmBop, I had hope that Weezer would be back. It would just take a while. If a rock album is 20 years old, does that make it a Classic Rock album? I hope not, because if they start calling Weezer’s Blue Album classic rock, then I’m going to officially be old. Weezer’s Weezer (the 1994 one, not the 2001 or 2008 one) was released 20 years ago today. It was the first CD I ever bought, although I didn’t get it until a few months later. There have been some good write ups on Blue published in the past few days, including Alternative Press’ 20 Facts You May Not Know About Weezer’s Blue Album (most of which I knew) and The Smoking Section’s “Undone”: The Story Behind Weezer’s Debut Album Cover (most of which was new to me). I should note that Weezer’s fifth album, 2005’s Make Believe (an excellent album on its own) was also released today. Seventeen years ago I was a sophomore in college. On this day back in 1996, I walked a few miles between classes to the one record store near Seton Hall University to pick up a CD that was coming out that day, Weezer’s Pinkerton. Once I purchased the only copy of the CD in the store, I walked/ran back to my dorm room, but was only able to listen to the first three songs before my next class began. All I remember about the class was not being able to wait to hear the rest of the album. Pinkerton was so different from the Blue Album (which was by then, my favorite thing to listen to), but not in a bad way. The sound of Pinkerton was more raw and the lyrics more emotional, which were a bad news/good news thing for the album’s fortunes. The rawness and emotion, combined with the public’s changing musical tastes meant the album didn’t do well commercially. In the year after Pinkerton’s release I was incredulous as songs like One Headlight and The Freshmen were played constantly on the radio, while Pinkerton‘s songs were ignored. At the same time, fans loved this approach and the public rediscovered the album a few years later after word-of-mouth and file sharing attracted more listeners, leading to the band’s resurgence in 2000. But by then, it was too late for Weezer’s Rivers Cuomo, who abandoned the approach that made Pinkerton what it was and sought out a more generic way of crafting the perfect pop rock song (this approach, which led to the Green Album, also was responsible band’s fascinating, yet vague (and too minimal) output in 1998). The band has also embraced (or re-embraced) the album, even releasing Pinkerton Deluxe Edition three years ago. The highlight of this special edition was Tragic Girl, a song originally demoed at the last minute then promptly forgotten. After my class, I rushed back to my room and listened to the whole of Pinkerton. I realized it was no Blue Album, but that was not a bad thing. It was an amazing, personal, rocking album. And it’s still amazing all these years later. I found out something important last week. If concert tickets say ‘Rain or Shine,’ that means the concert will take place outside. Also, that means there will be rain. 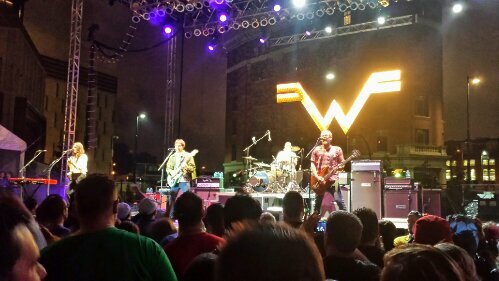 Last Friday, I saw my 12th Weezer concert outside the casino in Cincinnati (the outdoor concert was across the street from the county jail). The Civee graciously accompanied me despite the rain, which started as the opening band (Cincinnati’s Daap Girls) got their set underway. The Daap Girls weren’t the worst Weezer opening band I saw, nor were they the least memorable, so that’s a bonus. Although, the most entertaining part of the Daap Girls set was the dancing of the world’s biggest Daap Girls fan who was standing next to me. The rain let up for a bit before Weezer got started, but ramped back up to torrential levels about four songs in. Even with the rain, I enjoyed the show. The set list was along the lines of the greatest hits set they’ve been playing lately (don’t they have a new album they should be working on?) with the addition of No One Else, which was great to hear. They sounded good, and changed up arrangements on some of the songs, including (If You’re Wondering If I Want You To) I Want You To. Plus, they played No One Else. Something different about this show- the crowd felt older. A lot of the people around us were talking about their kids. There was a family right in front of us, with two kids who looked to be about eight or nine. Seeing that made me think that I may be able to bring Hope to the next show, although I may not be able to get as close as I did Friday night. Even though we was soaked by the end of the show (more accurately, soaked after standing there for 10 minutes), it was a fun show. The outdoor area of a casino across the street from a county jail made the location interesting. And while I could have done without the rain, it was certainly a memorable show. With apologies to Homer Simpson, everyone knows Rock Music attained perfection in 1994. Maybe I’ll listen to some Make Believe too. Since moving to Columbus 13 years ago, I’ve listened to mostly one radio station: CD 102.5. a locally-owned alt rock station. CD 102.5 (formerly CD 101) has a Guest DJ feature. Send in a playlist, and if they pick it, they’ll let you be on the air for an hour. Last month, The Civee and I were driving around and heard a promo. The Civee said I should try it, and I admitted I’d thought of it before. Putting together a playlist was actually pretty tough. I had to pick between 12 and 14 songs, mostly comprised of artists they play regularly. And I thought it would be a good idea if I kept it to one Weezer song. After some thought, I sent in a playlist and a few hours later, they scheduled my time on air. My guest DJ stint was today and it was a blast. I had to cut a few songs, but once the show started, aside from a short intro from DJ Brian Phillips, I did most of the talking. I talked about myself (And The Civee, Hope and Luke) and introduced some of the songs. They also let me cut a weather promo sponsored by The Easy Street Cafe. I put some life into the Easy Street Cafe promo and my coworkers got a kick out of my reading of their catchphrase: “Feta is Beta.” I had a blast and while I’d love to do it again, it’s probably better to let some other people have a shot. Besides, it’s pretty tough limiting myself to one Weezer song each hour. If you have to ask “why?” about any of these songs, the answer is simple: because I like it.